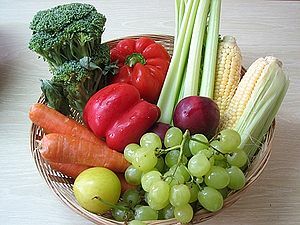 According to the Centers for Disease Control, less than 25% of us are even coming close to eating the recommended number of servings for fruit and vegetables each day. We all know that what we eat has a big impact on our health and eating 5 servings of these nutrient rich foods each day forms the foundation of the kind of healthy diet experts recommend. So if we know it is important, why are so few of us meeting the daily recommended intake? There are lots of reasons. Some of us think that fresh fruits and vegetables are too expensive. Some of us feel like we don’t have the extra time needed to prep, peel, and chop fruits and veggies to get them ready to eat. Others just don’t have the muscle memory to support choosing a fruit or vegetable option over something else. The good news is that all of these barriers are easy to overcome. Here in Arizona, we have access to fresh, locally grown, affordable fruits and vegetables all year round. Spend a little extra time at the farmer’s market or in the grocery store produce aisle in the coming weeks and use these tips to fill your plate and your day with fruits and vegetables. Another key to a healthy diet is eating a balanced breakfast. Many of us reach for common breakfast foods that are full of protein and carbohydrates like cereal, eggs, or bacon. Adding a serving of fruit and/or vegetables can help balance out your morning meal and increase your overall daily intake. Try Zesty Papa Protein Scramble or Boss’s Baked French Toast as you build a better breakfast. Amp up your fruit and vegetable intake while eating the same things you already enjoy by boosting the amount of these foods you are already using. The salads, sandwiches, and pizzas we already love to eat often have fruits and or vegetables in or on them. You can increase the number of servings you get from those foods by doubling the amount you normally use. If you create pasta sauce using pureed tomatoes, garlic, and onions, try adding some bell peppers, mushrooms, and even zucchini to the mix. One great way to get more vegetables on your plate is to sneak them into things like burgers, meatloaf, and sauces. Grating or pureeing vegetables makes it easy to add them to foods your family loves to eat without making it obvious that they are eating more veggies. Carrots, zucchini, cauliflower, peppers, squash, onions, and mushrooms are all great for sneaking into other things. It is easy to get into a rut and wind up eating the same few things over and over. You can expand your culinary experience while also increasing your fruit and vegetable servings by trying something new every week. There are a wide variety of fresh, seasonal fruits and vegetable available from local farms at the grocery store and farmer’s market. Each week, pick something new to try and use it in a few recipes over the course of that week. This month, beets (which a lot of people have never even tried) are in season. Pick up some beets and try out these great recipes – Beets with Onions and Cumin, Golden Beets, Fennel, and Avocado Salad, and Swiss Chard with Beets, Goat Cheese, and Raisins. This entry was posted in Food Facts, Fruit, Healthy Eating and tagged Arizona, Business, Chard, Fennel, Fill Your Plate, Food and Related Products, Fruit, Produce, Vegetable, Wine tasting descriptors. Bookmark the permalink.